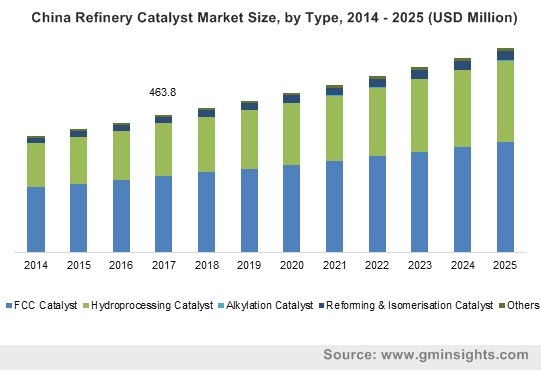 Refinery Catalyst Market size exceeded USD 4 billion in 2018 and is predicted to grow at over 4% CAGR from 2019 to 2025. Petroleum derivatives make up almost one-third of the global energy demand. These fuels primarily include gasoline, diesel, jet fuel, kerosene and fuel oil. More than 55% of the global demand for petroleum fuels comes from transportation. The overall transportation industry, comprising of automobiles, aircrafts, and ships, account for more than 60% of global fuel consumption. The sale of personal vehicles in increasing at a healthy rate, crossing 70 million units in 2017. Asia Pacific led the global automotive sales with China alone accounting for more than a third of the global share. With developing economic standards of the Asia Pacific nations such as China, South Korea, India, Thailand, and Indonesia, this demand is likely to witness further growth over the coming years. The remaining 45% demand for petroleum fuels come from the industrial and power generation sectors with the latter contributing to just around 5%. The rising demand for petroleum fuels will propel the crude oil refining sector, which will significantly boost the refinery catalyst market demand over the forecast spell. The refinery catalyst market growth may be hindered by the slowly rising popularity of alternate sources of energy such as natural gas, solar energy, wind energy, and other different renewable sources. Crude oil is known to have immense carbon footprint leading environmental damages across the world, which is prompting many organizations to look for eco-friendly options such as electric vehicles and solar power plants. These factors may reduce the dependency on crude oil products, hence affecting the refineries around the world, in turn hampering the refinery catalyst market over the coming years. Refinery catalyst market is bifurcated into FCC (fluid catalytic cracking); hydroprocessing including hydrotreating and hydrocracking; reforming & isomerization; alkylation; and other types such as desulfurization, etc. Hydroprocessing segment, dominated by hydrotreating catalysts, will witness growth by CAGR close to 5% from 2019 to 2025. Hydrotreating removes sulfur, nitrogen, olefins, aromatics, and other contaminants from distilled crude oil fractions and intermediate process streams. FCC segment will hold sway the market with around 70% of the global refinery catalyst market in 2018. FCC is a chemical process which utilizes a catalyst, mainly zeolite, along with heat to break the higher molecular weight hydrocarbons with long carbon chains into lighter hydrocarbons. The different materials used in refinery catalyst include metals, zeolite, chemical compounds, and other specialty materials such as enzymes, organometals, etc. 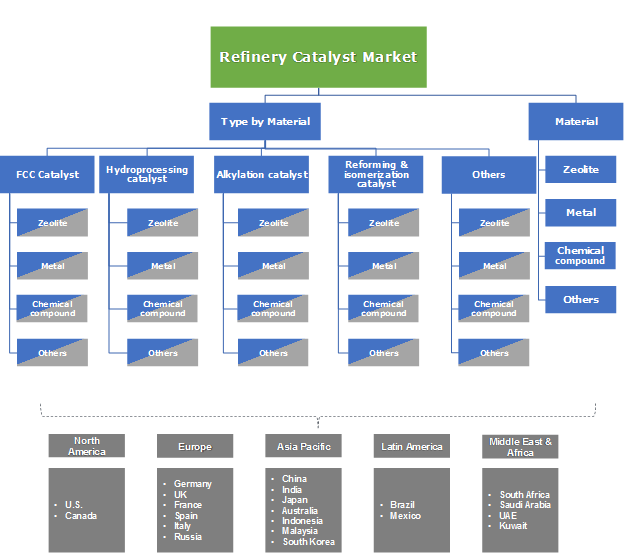 Zeolite based products in refinery catalyst market registered a revenue over USD 1.5 billion in 2018 as it is the most popularly used product in FCC units around the world. Generally, type Y zeolites are employed as refinery catalysts as they are significantly more reactive than other conventional products. Chemical compounds accounted for a refinery catalyst market value of over than USD 25 million and they represent a very small segment of the overall market. Low price of these chemicals make them suitable options for petroleum refining, especially for alkylation processes. Asia Pacific accounted for more than 40% share of the global refinery catalyst market in 2018 due to the large crude oil refining plants in China, India, Japan, and South Korea. The region is also the demand center of most of the petroleum fuels owing to large number of vehicle population in these countries. The region will also witness the fastest growth across the globe due to the upgradation and capacity expansions of refineries in India and China. . The world’s largest refinery complex of Reliance Industry is situated India with an annual capacity of 60 MMTPA. The refineries in this region are now upgrading and becoming more complex in order to extract light distillates from harder residues in order to increase their profit margins. North America refinery catalyst market generated more than USD 800 million in 2018 with the U.S. accounting for a little less than 20% of the global demand. The country has the highest crude refining capacity in the world with over 140 operational refineries and capacity of close to 20 million barrels per day. The global refinery catalyst market is highly consolidated with the top five companies accounting for more than 50% of the global market. Key players involved in the market include Honeywell UOP, Haldor Topsoe, Albemarle, W. R. Grace & Co., Royal Dutch Shell, Johnson Matthey, Axens, Clariant, and BASF. These companies work in tandem with the refineries to develop better and more efficient products, thereby maintaining their market position. There are several smaller players involved in the refinery catalyst market such as Filtra Catalysts And Chemicals Ltd., Chempack, Anten Chemical Co., Ltd, Criterion Catalysts & Technologies L.P, JGC Catalysts and Chemicals, etc. which mainly focus on fulfilling local or regional demands. Refinery catalysts are employed to break the heavier hydrocarbons into lighter derivatives with comparatively lower boiling point fractions. The industry is largely driven by the growing demand from automotive sectors in China, Japan, and India. These countries are focusing on enhancing their refining capacities to meet the growing demand, which will positively influence the product demand over the coming years. Strict government regulations for controlling air pollution and carbon emission by reducing the fuel sulfur content will further characterize the refinery catalyst market growth over the forecast span.